Classic floral look engagement ring is perfect made in 14k white gold. Center set a large brilliant-cut round diamond surrounded by smaller round diamonds all around and on sides too. 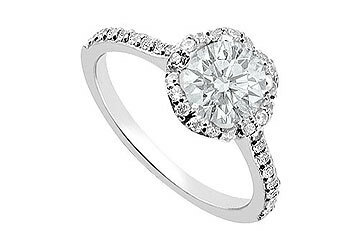 This lovely flower ring has a total diamond weight (TDW) of 0.85 carat. It also available matching complete sets of engagement ring with wedding band model no. JS3265ABW14D and single wedding band model no.W3265BW14D.